Bimare has a long history with the A Class, and this year they are launching a new version, the Zero. We contacted Valerio Petrucci to know more about Bimare's current, future projects and their excellent price offer on complete A-Cats. Valerio talks his view on design and class current growth. - Lots of new boats (paradox, d3, addiction etc.) in the class, you are now launching the Zero, which features/improvements/changes you have implemented? Valerio Petrucci: At Bimare we believe that the sport of sailing should not be “restricted” only to wealthy people. We've been striving for more than 30 years to make performance and technology available to all wallets. Our main goal has always been to market high quality and competitive boats at affordable quotations. There are many A Class designs on sale nowadays, all excellent boats ( - sometimes built by old friends/customers of ourselves -) making use of the most updated materials/technologies, but unfortunately at very high prices. We think to have done a good job with the our latest design, the Zero A Class, and we are hopeful to return to win some silverware in next season's races. The 34th America's Cup gave a significant impulse to the ( - so far quite neglected -) multihull community. At the moment we, together with many other multihull enthusiasts/architects/sailors, are assessing how to transfer some of the ideas/devices developed on the AC72s to our small cats, which is an interesting and challenging venture, but we are also of the opinion that we have to be “pragmatic” by offering to our customers the opportunity to upgrade their existing boats and not compelling them to replace them. - You will use rudders winglets? it seems every new production boat is using them, I do not see them as an expensive or difficult add on, which is your view on this? 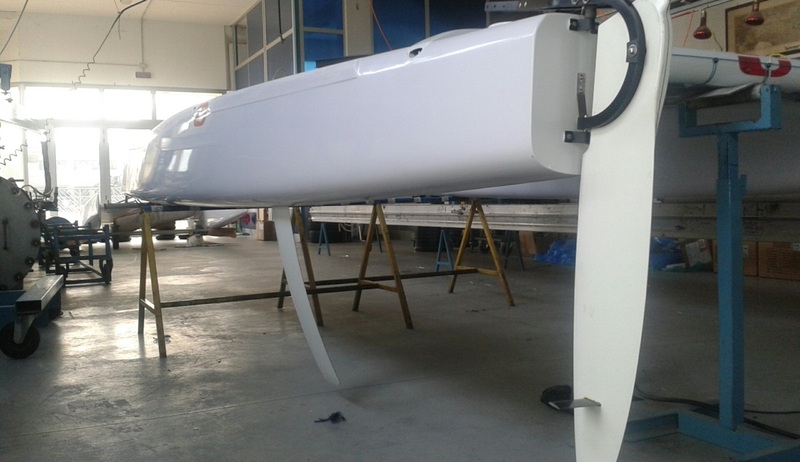 VP: We think that from a marketing and brand image point of view, it is a MUST for any racing catamaran builders to go for rudder blades with winglets. We have already started delivering our ZERO A cat with winglets. However my personal thought is slightly different: I am persuaded that foils are an advantage only when they are able to generate a “beneficial” lift. This is not always the case. In certain conditions for sure they are detrimental to speed. It is a trade/off. - You are also developing a new dagger case? VP: We have a few new ideas about the design of the daggerboard case, but this project is still at its early stages. Our current case is fixed and does not allow any adjustment (no slider). In 2012 we spent a lot of time playing with sliders in order to understand how to set the boards to the different wind/sea conditions. At the end we were unable to appreciate any sizable difference among the different settings so that for 2013 we chose the KIS (=keep it simple) option. According to our opinion a sturdy, well shaped and well located case is preferable to an adjustable system which necessarily adds complexity and play and moreover it is not operable during a regatta. - When the Zero will debut in racing? Team riders? VP: Our Zero made its debut at the 2012 Italian A class Championship. It placed 2nd (Francesco Marcolini) and 3rd (Teo Di Battista), showing a good pace and promising potential even if it had been just launched. - How are you seeing A class growth and development? VP: The A class has the great merit of having prompted the main design parameters to the architects of the big and powerful AC72s. There are so many evident and subtle similarities that AC72s has been often regarded as A cats on steroids. Needless to say this is a matter of great pride for us and other builders of A class cats. The almost unlimited budgets now available to AC consortia allow an unprecedented level of research (- both theoretical and on the field -) which already delivered astonishing advancements of speed. For sure the results of this experimentation will make faster also the small racing multihulls, including the A cat, but it is hard to say now which solutions/devices are going to be incorporated and when. - In the F18 there is a lot of discussion on costs, As are not that cheap either, you were offering a full A with sails for 16K eu? VP: According to our opinion, specially in the present economic climate, (low) prices are an important (but not the only!) key to keep a decent market share and to attract new blood into cats. As stated above we have always followed this marketing strategy. Sometimes, to be frank, we struggled to find the right mix between costs, technology and performance, that's not an easy job believe me! Luckily today it is "easier" to build boats with a good cost/performance ratio and a better value for money than only a few years ago. This is not to say that we are the best on the market, maybe good in our market segment. I am a sportsman and in sport the only thing that matters is to win or to be a close runner up. All the rest is chit chat. - How do achieve that range or what makes the diff compared with other builders (on cost/retail price range), and what others can do to match your excellent price ratio? VP: We believe that our competitors have nothing to learn from us. They are smart and competent people, friends who know how to manage their business often much better than us. The main reason behind our (low) prices is that we produce all but blocks, ropes and a few other minor parts in house. 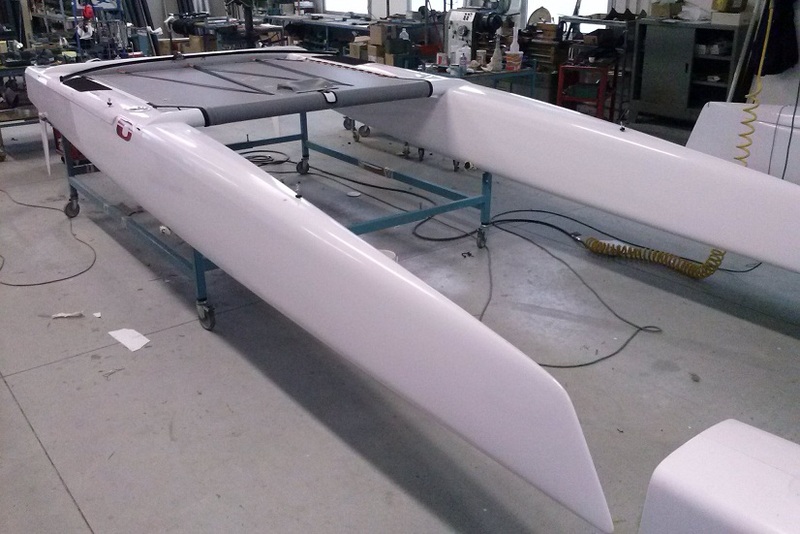 Besides there are other aspects that contribute to keep down our production costs: for instance the hulls of our catamarans are painted only on request (as standard they come with a white gel coat finish) . This makes our products perhaps less shining , but cheaper. It’s just a matter of marketing policy: the “perfect” boat, refined in all minor details is very expensive. On the other end with today's technologies we can offer very good products at a 30% lower retail price. - I also think is possible to downsize costs in the F18. Why you stop making F18s? I contacted you guys for some quotes for the Open Project , would you build it if requested? VP: Formula18 is crowded with many big builders. We are a small boatyard and if we had the ambition to compete in the A, F16 and F18 class, we will end up doing badly in all. We do think that the F18 class will not be harmed by the rushed choice of the Olympic cat, but for sure it will cause distress to several other catamaran classes. - Future projects from Bimare? VP: Our future projects mainly concern the development of A class and F16. Our goal is to bring back our boats at the top of the world rankings. We are planning various tests on rudders and boards to get the “right” amount of lift in all point of sail. We are working also on masts and sails in view of the European championship in Barcelona. Finally we are thinking about a new light 18-footer, an upgraded version of our 18HT incorporating all the latest innovations which are making AC72s so fast In short .... we're having fun!